Location: Varies day by day... follow them on twitter to find most updated spot! Taquero Fusion, I remember, to be one of the original food trucks in Chicago before all the other ones started sprouting everywhere. They have a unique fusion style cooking, combining different flavors from many Latin American countries. Everything is turned into a taco so they are definitely made for people on-the-go. 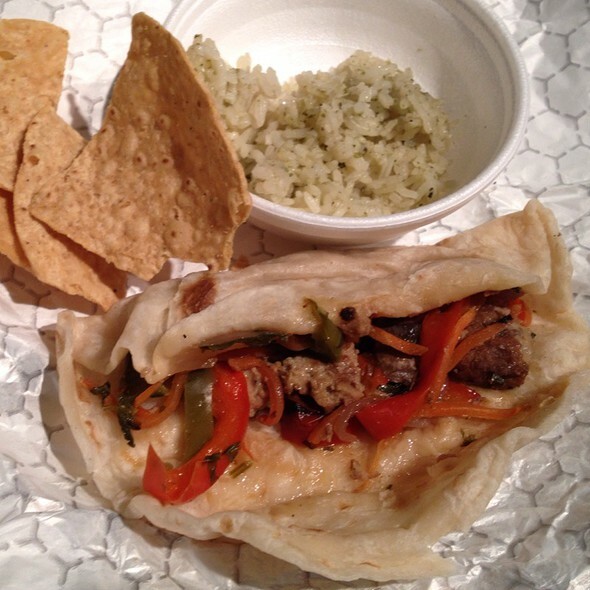 From the food I have tried, the flavors are there, the convenience is amazing, but the prices are a little high. At nearly $3 a taco, you are forced to get a "meal" to save a buck or two. Because of the cost and some of the unimpressive items, I couldn't give it that high of a rating. 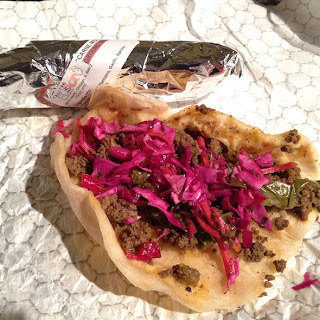 This fusion taco had ground beef with mexican seasoning, caribbean plantains, and some kind of purple cabbage slaw. The overall taco had an interesting flavor and it was good! It was a mix of sweet and salty with a vinegar-bite from the slaw. I did like the flour tortilla they used... it seemed thicker than usual and was a great vessel that could contain all the juices from the meat and plantains. So I wanted to try the veggie option on this truck. It had a mixture of red peppers, green peppers, onions, mushrooms, and unfortunately some kind of fake meat. I am usually not a fan of meat substitutes and this taco solidified by opinion. Its more like mush with a bunch of crispy vegetables. I did enjoy the vegetables they put in the taco. And once again their tortillas are delicious. I am glad I tried it, but I probably won't get this one again. 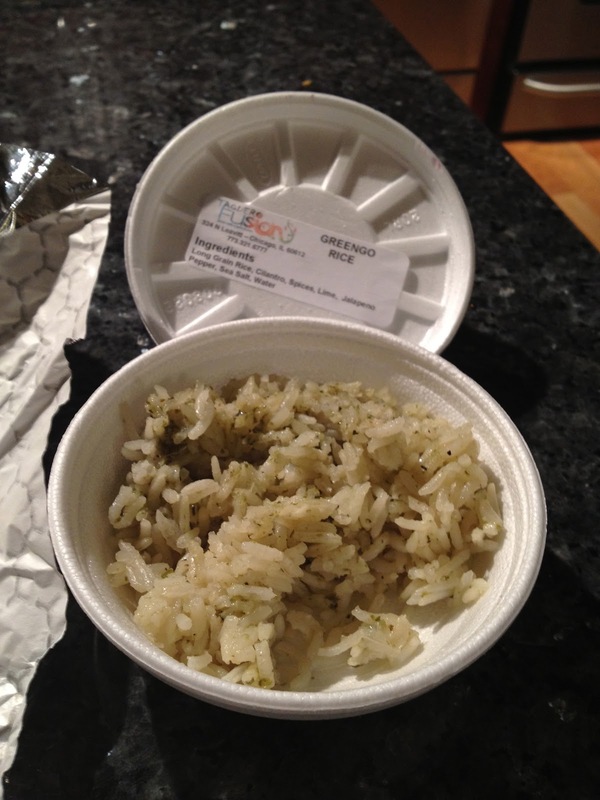 This rice is a jalapeño green rice. It looks green, but I honestly couldn't taste the jalapeño. It was almost like eating plain white rice... so I added some of the salsa and vegetables from the veggie taco to make the rice more flavorful. I thought this was one of the more creative approaches to their fusion style truck. A box of salted tortilla chips and plantain chips is served with two different types of salsas. 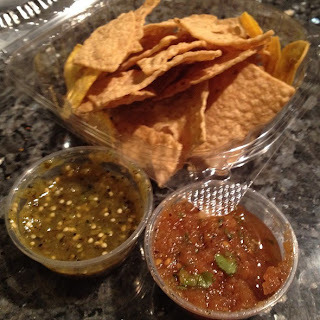 I loved crunchy and salty plantain chips... they are delicious and don't even need the salsa. I would definitely order this side from the truck! - Do follow them on twitter. Their location varies depending on the day.